I fell for Windows Phone while attending Microsoft MIX 2010. The OS had a fresh, albeit flat, minimalistic interface. I loved the vision of a common design pattern shared between the Windows Phone OS and its apps. And appealing to my logical side, completing tasks was incredibly efficient and streamlined. As one of the few remaining Windows Mobile users, I believed WP7 was the salvation of a stale and dying platform–possibly the next evolution of mobile interfaces. Then reality set in. I waited months for a CDMA-based device to launch and then finally switched to Sprint to buy the HTC Arrive. The years to follow were a mixed bag. Carriers delayed the availability of OS updates. Microsoft changed architectures and forced me to buy a new phone to upgrade to WP8. The app ecosystem never caught fire. There were apps to meet critical needs, but for other services I had to find an average 3rd party app. I always felt a little disappointed that many innovative apps lacked a WP counterpart. I often found myself relying on mobile web interfaces instead. And Windows Phone lost some uniqueness when Apple eventually responded and went “flat” with their mobile interface design as well. Anyone following the recent news has seen a flurry of articles proclaiming the death of the platform. Things seemed bleak when Microsoft announced massive layoffs of personnel and the subsequent write down of the Nokia acquisition. A version of Office was launched for iOS and Android with some compelling functionality not available in the Windows Phone version. The Windows Mobile 10 launch was delayed behind the availability of Windows 10, with no mention of a specific release date. New phones will be announced “soon”, but as of this writing no specific details have been provided. My two-year contract is up, and for the first time in my life there isn’t an upgraded Windows Phone to consider. It’s always darkest before the dawn. It is clear Microsoft’s past strategy was not succeeding (yielding flat growth and a mere 2-3% market share for Windows Phone). But it’s more important to look at the current strategies and trends instead of results from past strategies. And that’s why I’m still betting on Windows Phone—because I believe in Satya Nadella and the ways he is transforming Microsoft. I believe the play behind reducing staff is all about focus. After the acquisition, the division continued to make Android-powered Nokia X phones. In fact, according to Bloomberg, Microsoft is currently launching an average of about one new phone per week. With the new strategy, Microsoft will release one or two models each year within three target markets: Enterprise, Budget, and Flagship devices. This much more closely aligns with Apple’s successful strategy—they release about two phones per year. This will hopefully keep hardware fragmentation minimal and improve the speed for Microsoft to continue releasing new software updates. Microsoft is finally realizing its vision of a single platform across devices that started years ago with the development of .NET Framework. With the release of Windows 10, Universal Apps allow an application to be written once and run across desktops, tablets, phones, and even Xboxes. For any publisher writing apps for desktop, the cost of building phone versions is now lower. And it appears Microsoft also realizes that this strategy alone won’t solve the app problem. Microsoft has launched two other projects, Islandwood and Astoria, that allow iOS and Android engineers to rapidly port their apps to Windows Phone. If these projects deliver, the ROI on moving to Windows Phone might just encourage more companies to support the platform. And there may be a silver lining hidden in the bad business stats. As of the end of 2014, although Windows only had 1/3 of the total apps and 1/6 the total number of app downloads when compared to Android, it still posted total app store revenue of $1.25B (compared to Android’s $1.8B and Apple’s $6.9B). Total average revenue per app was $1,894.74 for Android, $3,906.25 for WP, and $5,726.14 iOS. If you consider revenue per download, WP leads the pack at $0.25 compared to $0.24 for iOS and $0.06 for Android. In short, Windows Phone users are willing to pay for apps—and this should continue to draw developers now that it’s even easier to build apps. The final reason I believe in Windows Phone is that I believe in the ecosystem. It’s not about a Windows Phone beating the iPhone. It’s about the entire stack and how integrated it becomes. It’s about a shared platform among devices (IoT, phone, tablet, desktop, servers) and Azure cloud services. It’s about innovative devices such as Microsoft Band, Xbox, and HoloLens. It’s about breathing new life into established products — Microsoft Edge’s performance is now competitive with other browsers. And we can’t forget complete packages like Visual Studio and Office—now available across platforms to encourage wider adoption. I don’t expect an overnight transformation. Microsoft appears to be patient and is playing a long game. But I do expect to see meaningful results in the next 2-3 years. There’s also precedent for incumbents failing in this space— anyone remember Blackberry? And what if Microsoft can finally give me one device to carry that meets all of my needs (Microsoft Continuum powered by upcoming Intel-based Phones early next year). That could be a game changer for millions. 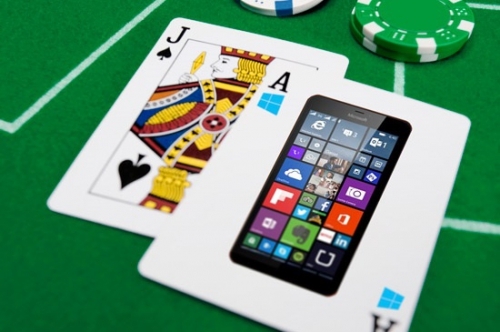 And that’s why I’m betting on Windows Phone as a piece of the larger puzzle. Microsoft—I’m all in. Are you?